Several nights ago, we were awakened in the “wee” hours of the morning. At first it was a “meow” – outside our open window. We have cats in our neighborhood – several in fact. My first thought was this: – “must be one of those cats we see during the day”. I turned over and went back to sleep. Then a little while later, “meeeeeooooow”. This sounded different – low and mournful. It continued in this fashion for some time – and I went to see if I could see anything out the dark window. I couldn’t. It stopped. Again I went back to bed and to sleep. Every hour, or so it seemed – this sound continued. By morning both Greg and I agreed that we didn’t get a lot of sleep because of that crazy cat! Just where it was and whose it was – continued to be a mystery. This incident put me in mind of when I was in junior high school and was commissioned to feed “Louie” – a white persian cat who lived across the street, while the neighbors went on vacation. Although Louie had never been to my house – much less my bedroom – he knew which open window was mine! In the early morning hours he would position himself under it and MEOW until I could stand it no longer. I would drag myself out of bed, pull my clothes on and reluctantly go across the street and FEED HIM!! Anything to just SHUT HIM UP! And for a brief moment in the night – I did wonder if this poor cat was somehow hungry – although it was inconceivable in our neighborhood full of cats and dogs and very attentive owners. Later that day I was taking a nap and through the open window I heard the “Meow” again. I thought I was hearing things. It was really weird. Then it went away the same mysterious way it had in the night. We were getting ready to go to bed that evening and I told Greg, “I’m just going to stand on our porch and see if I can hear that cat again – you never know, right”? I wanted to make sure the poor thing wasn’t injured or hungry and was making the rounds through the neighborhood. I opened the door – stood on the porch and called in a pretty quiet voice, “kitty, kitty”. I heard it AGAIN!!! The answering “Meow”. I opened the door and said to Greg, “you’re not going to believe this – I called and the cat answered! By this time Greg came out too – very anxious to find the mysterious cat. I’m sure motivated by the fact that we didn’t want another interrupted sleep. So I kept calling – and the cat kept answering. But he would not come to me. It was puzzling. How long could the cat stay away from my beckoning – especially if so hungry and lost? I walked across the street and tried to follow the sound of the “Meow”. It would stop – then continue again. Finally after what seemed like 10 minutes or so – Greg came across the street – looked into the tall evergreen trees and said, “that cat is up in the tree”. What happened after that took about an hour. Because it was so dark – Greg grabbed his most powerful flashlight and we both tried searching the trees – calling and calling – but we could not find him anywhere! Greg then took his 30 foot ladder and proceeded to climb it in order to get a better look. This made me a little nervous – especially in the dark. Greg attempted to calm my jitters by saying, “I climb these tall ladders all the time to do windows” – “yeah not in the dark” I said. After 2 attempts to find the cat up the ladder, I decided to go back into the house and call animal control. Surely they would know what to do and send someone. They directed me to 911 – and from there they connected me to the fire department, who I found out (Greg had warned me of this fact) they DO NOT COME AND GET CATS OUT OF TREES. The fireman told me that when cats are hungry enough they come down on their own. I said, “Really? – he’s been up there for 24 hours now”. I was disappointed, hung up and went back outside. When we finally spotted the cat – in ANOTHER tree other than the one Greg had climbed – we discovered he was at least 40 feet up and there was no way to rescue him. We could see the reflection of his eyes in our flashlight. It was so sad to have to leave him there – we were sure he would not be able to make it down on his own. The funny thing is this: There were NO NEIGHBORS out and about – it was only about 10:30pm. Where was everybody?? – while we were out in the woods of our cul-de-sac crashing around with ladders and flashlights and “HERE KITTY, KITTY! !” It was insane how lonely and deserted our street was at that hour when usually we would hear people coming and going – our neighbors getting home, letting their dogs out and having loud conversations under our open window. Not this night. Everything was completely still. It made us sad – but we had to go home and turn a fan on so that we would not be kept awake all night with the mournful sounds from the tree across the street. In the morning as soon as it was light enough – we went across the street – I called out – no answer. We search around – looked up where the cat had been, where it was hard to see in the dark – no cat! We have NO IDEA what happened after we gave up and went home. Did the cat find the courage to climb down after all? There was no dead cat and no sign of a live one either. It remains a mystery. Oh poor kitty. I hope you’re okay and found your way home. Today we made another discovery with our 7 month old puppy, Daisy. She is not a normal dog. She is picky like a cat. She does not scarf down food – instead sniffs it and sometimes will eat it. If it suits her. She eats to live – not the other way around. 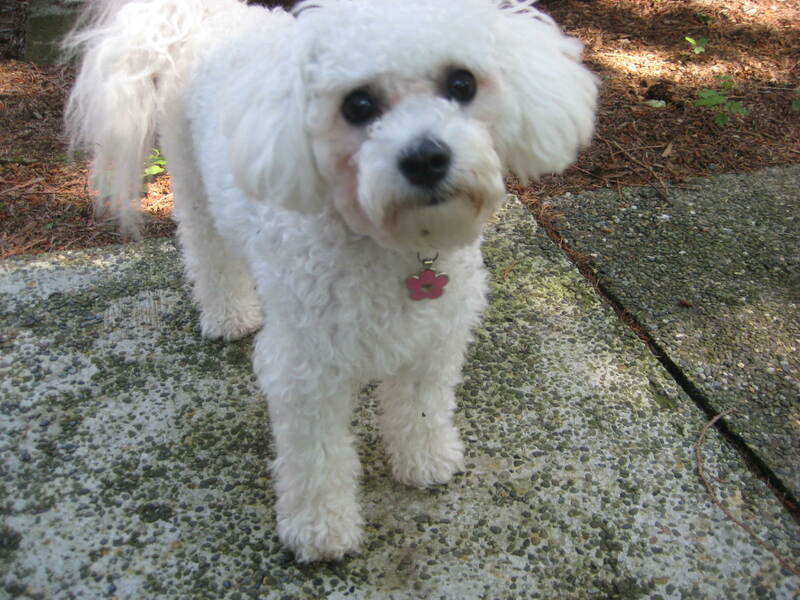 Because she is a small white Bichon Frise – she also has tear staining issues. We’ve tried everything. But since being on more of a raw diet (fresh meat, freeze-dried and air-dried raw) she is much improved. We were also told to get stainless steel bowls for her water and food. She had pink porcelain before – but just in case any dye could seep through – we decided to try them. Well believe it or not – she was FREAKED OUT because she could see her reflection in the shiny new bowls. We tried to coax her to drink her water but she would NOT go anywhere near those scary things. So we returned them and got plastic. With plastic there is no clanking of her tag against metal or porcelain – so a double bonus. 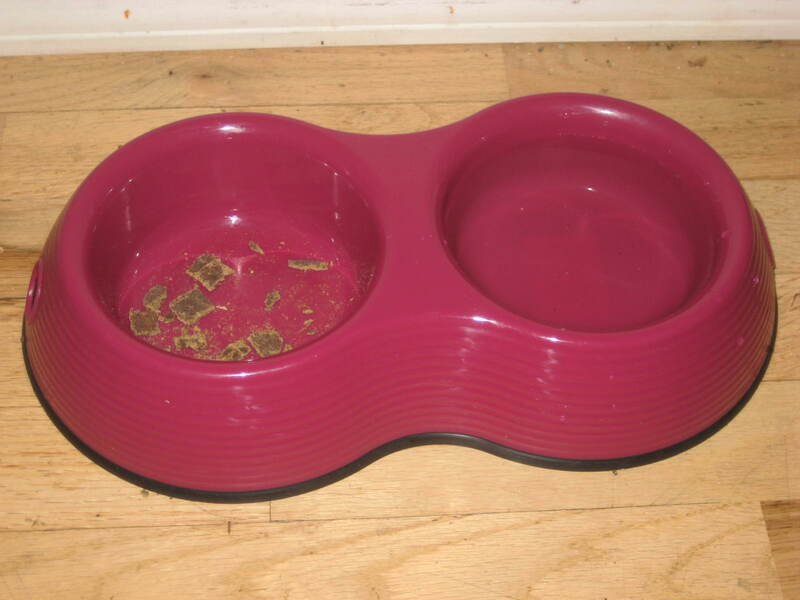 But with these new bowls – there was another problem. They were scary and deep. She simply would NOT put her face inside the bowl to eat her food. Drinking was okay because she didn’t have to go as far inside the bowl. 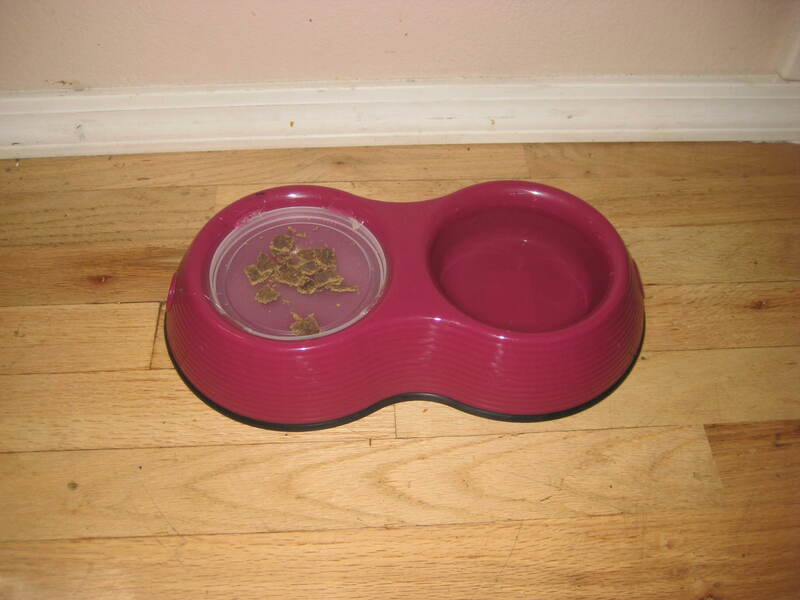 But in order to eat – we would have to put her food on the floor beside the bowl or hand feed it. Because she is still a puppy – it is important for her to eat – tough love doesn’t work for growing puppies. But we made a discovery! When we brought the food up higher in her bowl – she went right to it and ate it just fine! So Greg got a plastic lid – and with a little hot glue – he glued in to the inside of her bowl. Guess who is eating now? With NO PROBLEM. It’s the little things in life – that cost nothing, that give the most satisfaction. When was the last time you had a “quick fix”? We’ve been waiting since July for the day where we would go pick her up and drive her home. There have been a few twists and turns along the way – which made the waiting harder – but wait we did. Two weeks ago we went to visit and pick out just which special puppy would be “Daisy”. And at the right time where she was old enough to leave home – we took the journey to go and get her – this past Sunday. Now I have not been the parent of a “baby” human or otherwise – in 20 years. So this was no easy task – I can assure you. And although she is very good – and really smart – she is still a baby and very needy – more for attention than anything. She does not like me out of her sight – so when she is “passed out” after eating, doing her business outside and playing hard – I have a few minutes to myself to shower, dress or anything else that needs doing without a puppy in tow. Daisy is a sweet bundle of love. Well worth the inconvenience for a few nights of adjustment without the usual amount of sleep, to make sure she is comfortable and safe. And since Bichon’s prefer human company over anything else – she not only sleeps with us at night – but stretches out and takes up most of the bed too! 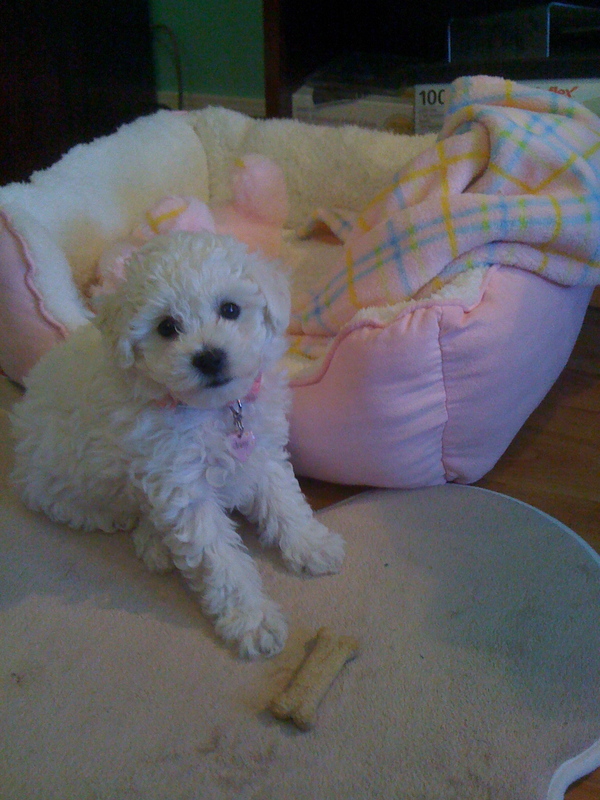 For those of you that have had a puppy – or a Bichon Frise dog of any age – I think you’ll agree that they are worth the effort and give lots of humorous moments, love and sweetness – all the while looking adorable and cuddly. I’ve met many new friends online who also have one of these special dogs and have discovered a bond of friendship with them, sharing our love of puppies and experiences with them. And I’ve had countless support from many of my friends who have either a dog or cat – and think of them very much as their own children. The love and encouragement have been priceless over the past several months and I feel as if I look at things in a strange new way, like a whole new world has opened up to me. And I think – what a creative God we have! He even cares about little puppies and made each of them with love and care – attention to detail that bring out a very special tugging at our heartstrings when we see them. Recently I saw a program about puppies. There is a chemical released in our brain when we are around a puppy – bringing out pure joy and happiness. How many have said they love “puppy breath” and wish they could bottle it? Me too. Yes – there’s something about a puppy. 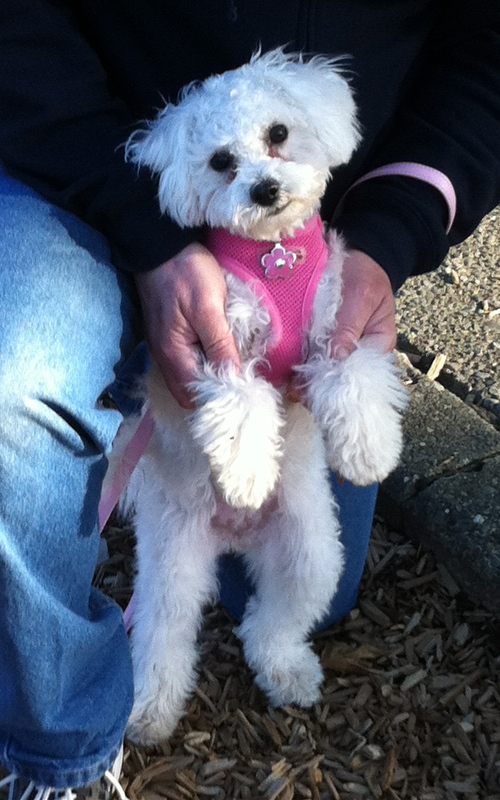 Below is a picture of our little Miss “Daisy” and a video too. I’m going to be a mommy again. 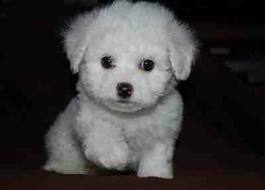 We are adopting a Bichon Frise puppy – the end of September. I have always wanted one of these dogs – looked up their history and temperament and talked to several people who know about them or have owned them. I was sad, however to learn that they are expensive dogs. And no wonder – they were the ones that the French royalty had as lap dogs for several centuries. So I had given up and started to inquire about other mixed breeds that had 1/2 Bichon in them. Bichon’s don’t shed and are considered hypo-allergenic and have a cotton like hair all over their bodies – soft and luxurious. When mixed with the Royal Cavalier or other shedding dogs – they are perfect non-shedding dogs. But as I inquired – I was more and more discouraged. Even the mixed breed dogs were expensive. And adopting a puppy from the human society or pound in our town was really expensive. Who knew? But we did look and inquire. Everything about another breed of dog didn’t fit well with me. I needed a house puppy with a pleasing temperament, sweet, gentle, smart and loyal. One that would adapt to me and my lifestyle – enjoy children and music lessons – not be hyper or yippy. 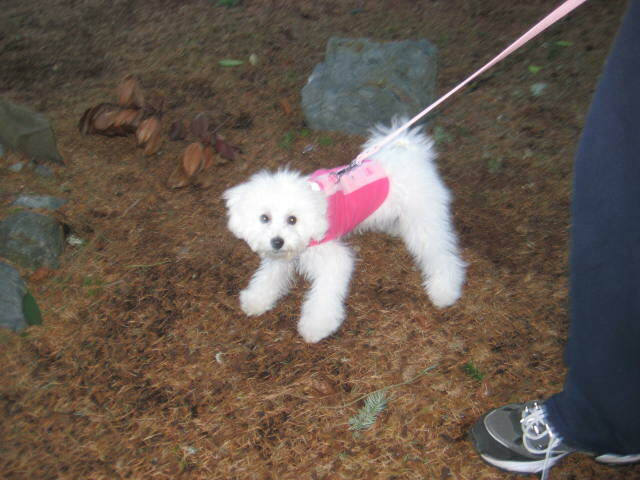 I found my puppy on Ebay classified ads – and she is in the Tri-Cities area of Washington – raised by a loving family who only have Bichon Frise dogs – and know everything about raising them and loving them. I am getting my puppy at a much less rate than other mixed breeds and only a fraction of the price that she is worth! Why? Because this family really loves their dogs and believe that there are good owners out there regardless of how much money you make – and know that some of the best owners are not rich – but instead have a loving family that should be allowed to adopt a puppy like this. She apparently liked what she was hearing from me – and knew that this puppy would be my baby and be loved and treated right. I spent over an hour on the phone with the owner of the mama dog last night. My baby hasn’t been born yet – due the end of July. But I have several pictures of the mother and father Bichon and other puppies so I’m sure about what my puppy will look like. She is a pure-bred AKA dog – if I desire to show her – or breed her, I would probably not do either – but it’s nice to know her pedigree and rich history – just in case. Bichon Frise dogs live 15-20 years and become real members of the family. We are excited around here for our new addition and need a suitable name for an all white precious little baby. Any suggestions for cute names would be appreciated – I’m knocking around about 25 names right now! How do you choose??? What kind of puppy do you have? Are you a cat or dog lover? Or both?